Before the selling of used items became a widely accepted form of business, Reed Lappin somehow stumbled upon selling records as a living. Originally hailing from New Jersey, the 57-year-old current Bostonian started pushing vinyl outside of flea markets in Beantown’s heavily clustered college surroundings. 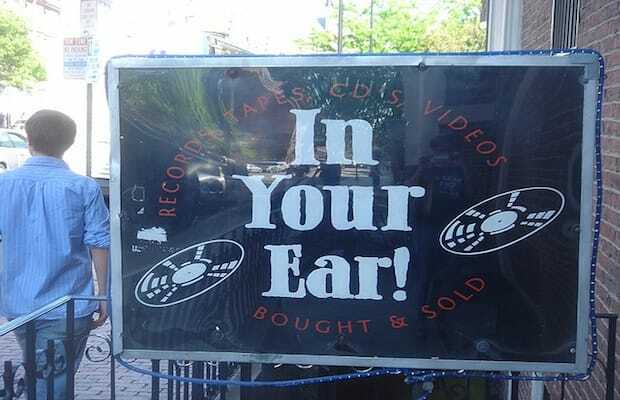 But when sites started to get shut down, Reed and his partners decided to open a physical store, which lead to the birth of the city’s currently cherished record hot spot, In Your Ear Records. While two locations are running, Reed can be found at the Boston shop (around Boston University) on a regular basis. Offering a great variety of records (with an emphasis on &apos;60s rock and folk), CDs, and DVDs that number over several hundred thousand discs, this locale is certainly for diggers willing to fight the dusty bins to most thorougly wax nostalgic. Despite having to deal with customers during our chat, Reed happily answered our Wax Nostalgic 7 Question Survey. Reed Lappin: The first record I bought was the The Monkees, their first album. I was probably in the sixth or seventh grade. This was back in the late ‘60s. A lot of records back then were like $2.98 or $3.98. Or they would be cut outs for like $1.99. They used to have records in a lot of department stores, and they would have sections of real discounted records, just unknown stuff. Those were in the cut out bins. That started opening things up for a lot of people. You could find new records, sometimes like three for a dollar. That was like an exciting time when you could just wander the stores. Out in [Boston], at Filene&apos;s Basement, they would sell records for like ¢19. Sometimes you’d go there and find The Yardbirds records for cheap prices. A lot of people quickly figured that out, and started shopping in those types of bins. Just think of it—when records were that cheap, you could sometimes walk out with 20 records for $10. What’s your favorite record this week? Reed Lappin: I don’t know. I don’t like to keep looking at records that way. I hate dealing with people who are all about the prices. But there are constantly people who are trying to be like, “Let me see your really good stuff!” You know? They’re just about the price, and not the music. It’s just kind of annoying. Reed Lappin: Oh, I don’t know. [Laughs.] I could be like, uh, working in a number of different businesses. I might just work at Trader Joe’s like a lot of other people, who knows? I might be selling something else if I didn’t sell records. I have a bit of understanding for collectible markets. I might pick up something else for buy and sell. Reed Lappin: Well, it’s about discovering music, you know? Sometimes you can do it through all your online searching, but sometimes you get a different bent on going around looking at covers and finding music that way. And there is so much music on records that’s not online. I mean, it’s all a different search process. Everything is going to involve research, even if you’re randomly looking for things. But if you’re trying to figure out things you like, you have to go through some sort of search to learn about music. Some people just go the Pandora route, where they’ll say, if you like this, you should listen to this. What they might not understand is there’s a person behind that information deciding what you should listen to, when you should try to do that yourself to some degree. Or you can look for the right mentor to tell you what’s good, but there are also many bad mentors out there. Some people will just tell you everything that’s trendy. Reed Lappin: It’s possible vinyl will die out. Everything can die out. But it might take a lot longer than people expected because there have been so many record revivals. This last one seems to be pretty strong. While there are still lots of vinyl in the world, I think people are going to continuously rediscover things, and put new stuff out. At this point, vinyl does seem to have some longevity. Reed Lappin: I might have played a record while I was, but [laughs] I don’t think it lead to it through a record. The mood music really depends.